Every culture has some type of weaponry as their armaments, war needs and basic personal protection. They were not just battle tools but specified the warrior status. They were the genesis of the genius of the metal and metallurgy craft. At Khukriwala, we bring you a vast repertoire of the most exquisite products to refurbish your place and to satiate your penchant for the antiques. We bring the most exciting world of swords and armors. Whether you are an amateurish collector or a passionate regal decorator, you'll find an impeccable range of armory products under different groups such as Swords, Armors, Daggers & so on. The only means of body protection, they evolved from padded leather to chain mails and much advanced forms with the development of more sophisticated weapons. They at one time were a mate of the warrior. A shoe is an item of footwear evolved at first to protect the human foot and later, additionally, as an item of decoration in itself. Made from pure leather we offer shoes in varied designs, from boots to ancient roman sandals, our range encompasses shoes of all styles. Axes are one of the oldest weapons used by the mankind, it has long been a symbol of power near to godliness. The purpose of axe decided its shape, size and pattern. The axe was at one time a status symbol. They are simply great collector pieces. An Axe-Pole Arms is a weapon that consists of a broad, short axe blade that has been mounted on a wooden shaft or a pole. Available in iron and wood, the pole is generally 4 to 5 feet long. Our range of hand held protection weapons are available in various shapes, sizes and materials. It was the most favored type of armor to deal with more sophisticated weapons. Translates the status symbol of the knights and a part of their life and style. A well made chain mail could spell life and a weak chain mail, its end. Using dagger was an art in itself. It was not just a battle tool but specified the warrior status. One of the most dangerous close combat dueling weapons, the craftsmanship of a dagger will always remain unmatched. 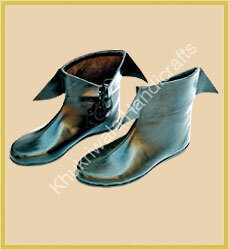 Damascus are made from a range of quality material, like steel, buffalo horn, leather, aluminum etc. They are used for various purposes like hunting, boot knife, push dragger and serve as excellent show piece as well. 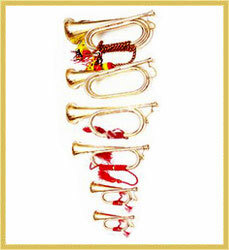 Bugles are the simplest brass instruments that has no valves or any other pitch-altering devices. The pitch is controlled by varying the player's embouchure, as it has no other mechanism for monitoring the pitch. Owing to which, the bugle is limited to few notes within the harmonic series. The ancient handcuffs were as unique and strong as the recent ones but more complicated. 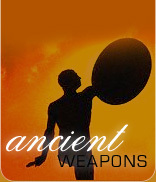 They were the integral part of armaments through the ages. A weaponry collection is incomplete without it. Helmets are considered as one of the most universal forms of armor. Offering a defensive covering, helmets protect the head, face and sometimes the neck of the warrior from the cutting blows of swords, spears, arrows and other weapons. Every culture has some type of knife as a basic personal protection. It was not just a battle tool but specified the warrior status. Generally used for the short handle, short blade, single edged blades, it is actually a generic term for almost all bladed-weapons. Whatever be the origin, it is today an out an out deadly Gurkha weapon. It is used in religious ceremonies as well as in wars. Never find a Gurkha without it. The shape like Lord Shiva's third eye, it comes in varied sizes and decorative sheaths. Apart from the armor, shields were the main form of body protection. Crafted beautifully by the unique touch of the craftsmen, these hand held protection devises come in various shapes, sizes and materials. They are artifacts in themselves. The sword canes are walking sticks with a dual purpose. They are used to hide swords or knives. They were brisk, graceful and flexible. Some were very elaborately decorated. Sword canes make for ideal regal decoration. No arm or weapon has so many variations as a sword. It forms the prized possession of the collector. The blade, the hilt, the sheath, be it any part, swords, the symbol of aristocracy comes in innumerous patterns. Tomahawk is a light axe earlier used as a tool or weapon by Native American Indians. They could be used as clubs, or as hunting tools. They were light enough to be thrown at the enemy and decorative enough to embellish your place. Walking sticks have existed from the day man needed support while walking. Not just a support, they mark the style. It was at one time a mark of the privileged class. The harshest of all weapons, they mark the animal nature of the humans. They are just the collector's items and come in various forms. Your adventure and thrill collection is incomplete without a compass, dividers, navy dagger and other such marine instruments. Our miscellaneous products are a reminiscent of the ancient war culture, including products like a brass badges, sword, handcuffs etc. Expert craftsmanship of our experienced artisans make products a complete look alike of the description given to them.